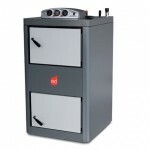 Log Gasification boilers have the advantage of been very simple and reliable, with the added bonus of very cheap fuel. We have a range of log boilers that cover most installation sizes for this type of boiler. For those on a budget but still require a quality product you will love the Tecnika. Pyrolysis* inverted flame wood boiler with high temperature combustion for high efficiency and fewer emissions. Thanks to a water temperature control system, the log boiler automatically adjusts the quantity of firewood burned. Easy cleaning and maintenance. Available with two power ratings 28 and 35 kW. Buffer tank requirements is 28 kW boiler will require 1,500 litres and the 35 kW boiler 2000 litres, hot water modules are available for both all sizes to save extra space for a hot water cylinder. The higher efficiency and greater burn control with the use of the lambda sensor this basic log boiler is packed with features including full internet connections for monitoring and alarms. • Controlled return riser with mixing valve.